Reports from Egypt: militants are controlling the streets of the Sinai Peninsula and attacking police officers. Military trying to gain control. 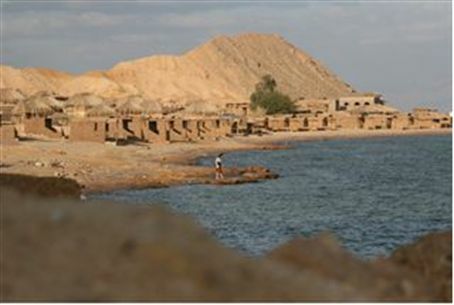 The recent revolution in Egypt has had its effect on the Sinai Peninsula as well. Mass demonstrations by the Egyptian police have broken out in the northern Sinai in recent weeks, the Palestinian Authority-based Ma’an News Agency reported on Wednesday. According to the report, the demonstrators are protesting against their low quality of living as well as against the fact that they are forced to live in constant danger of death and kidnappings by lawless marauders. Ma’an reported that the demonstrators gathered in front of the security administration building in the northern Sinai and demanded that the rules of martial law cease to be applied to them, that their wages be raised and that protection be offered to them from gunmen who chased after them and burned down their homes in the city of El-Arish. They also demanded that security director Mohammad Najib and his assistant be dismissed from their positions. According to the reports coming from the region, there is a state of anarchy in the northern Sinai Peninsula. More than ten days ago three police officers were kidnapped, and their cars were subsequently found burnt in the suburbs of El-Arish. In addition, it has been reported that dozens of policemen are hiding and fearing for their lives. Police officers serving at the Rafah border crossing have been harassed daily by militants who attack them as they return to their homes, beating them and forcing them to crawl on the ground. According to data released by local security and medical officials, approximately 35 police officers and civilians have been killed since the beginning of the riots in northern Sinai. About 150 people have been wounded. In light of the security situation, Egyptian army forces have begun to take positions in various parts of the Sinai Peninsula. According to the peace agreement between Israel and Egypt, Egyptian forces are forbidden to enter the Sinai Peninsula without Israel's approval. However, Israel recently approved, for the first time since the signing of the peace treaty, an Egyptian request to bring the army into the Sinai Peninsula for the purpose of controlling the riots. The Egyptian forces have been placed in sensitive areas, including the route linking the Suez Canal with Rafah as well as along the natural gas pipeline, which was recently blown up in a terrorist attack. The February 8 explosion was initially blamed on a gas leak, but a probe conducted by Egypt later found that the explosion was a result of terrorism, and that it took place after four masked gunmen set off a bomb in the terminal.